All my dear lovelies you guys know how confused we all are just to go on a simple lunch date in casual wear. Am I right girls? We don’t really know what to wear though our wardrobe is full of nice clothes. Casual wear generally reminds me of pants and tops. I avoid getting too dressy and like to keep it simple and elegant. Lunch Dates are when we need to keep room for all the extra food and wine which go unnoticed in between long conversations. Hence its important to hides the belly fat so wear something that gives you that extra room. Fitted tops are a strict no-no for me. So here is a cute pink top, simple but a cute one with amazing fabric which makes me feel so nice, which I paired with my black tights which almost goes on everything. 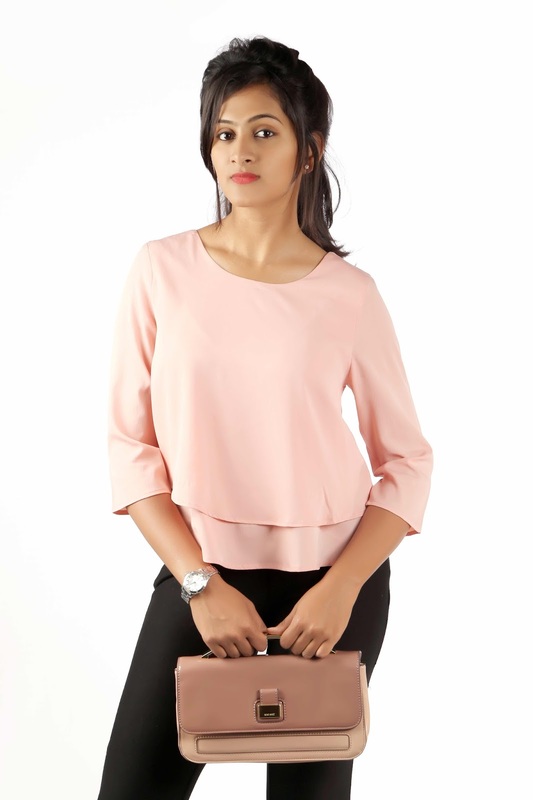 I got this pink top from OxolloXo an upcoming online store. To make it look better I carried a stylish bag. A simple hair do can sum it up. To complete the look shade of red lip color will add glamour to your look. Girls don’t forget there is beauty in simplicity. Hope u loved it. You can buy the same top here or check out the different colors its available in. That outfit looks great on you! :) I'm all for loose-fitting clothing, especially when eating out. Pretty top ,I have seen the brand in other online stores but did not know it had a separate website.